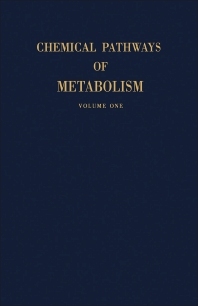 Chemical Pathways of Metabolism, Volume I focuses on the chemical steps involved in the metabolism of the major constituents of living organisms. The selection first elaborates on free energy and metabolism, enzymes in metabolic sequences, and glycolysis. Discussions focus on comparative biochemistry of glycolysis, enzymes of the glycolytic cycle, oxidative conversion of glucose to tetrose, transmethylation, and free energy and its determination. The manuscript then examines the tricarboxylic acid cycle and other pathways of carbohydrate metabolism. The text ponders on the biosynthesis of complex saccharides, including mechanisms of disaccharide formation, syntheses of branched polysaccharides, synthesis of levan from sucrose, and reversibility reactions by hydrolytic enzymes. The publication then elaborates on fat metabolism and acetoacetate formation and sterol and steroid metabolism. Topics include androgens, sterols, phospholipides or phosphatides, path of fat absorption, and theories of fatty acid breakdown and acetoacetate formation. The selection is a dependable reference for researchers interested in the chemical pathways of metabolism.